Om Rsivandyaya Namaha, Salutations to the One who is worshipped by the seers, the rshis! Rshis are the ancient seers who won vision of the Supreme Lord and gifted the stories, mantras, prayers and rituals to humanity in order that they may worship aright and win the self-same vision. In year 2017 (1939 Hemalambi) Shani Jayanti is marked on Thursday 25 May 2017. Shani Jayanti is marked as birth anniversary of Lord Shani. Shani Jayanti is also known as Shani Amavasya. 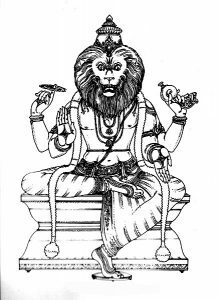 Lord Shani is son of Lord Surya and rules planet Saturn and Saturdays. It is believed that Lord Shani believes in fair justice and if appeased blesses His devotee with good luck and fortune. People, who don’t have blessing of Lord Shani, toil for years without getting any reward for their hard work in life. In this message on 2017 day of Shani Jayanti, we bring Sanaischarashtakam and Shani stotra (Dashrath krut). Om Urudvayanirmuktanijasarathaya Namaha, Salutations to the One whose charioteer is cut off at the thighs! The sarathi, charioteer, while disabled, paves the path of the Sun as the path of dharma, right action, right conduct, righteousness. Om Viraya Namaha, Salutations to the One who eternally vital, strong and who surges within the heart with subtle illumination! Om Hrishkesaya Namaha, Salutations to the One who is fully in control of the senses and is filled with joy. When one masters the senses, the outward-going mind is under control, fear, desire, attachments all pass away. Om Vasave Namaha, Salutations to the One who is a shining jewel; goodness itself. The Sun’s qualities outshine those of any gem. Om vasupradaya namaha, Salutations to the Sun who is the giver of wealth.